Commissioned by Jacob Swanson, sax. “Invisible Cities” is the title of a poem-novel by Italo Calvino. The author imagines a conversation between Marco Polo and Genghis Kahn, who describe travels to other fantastical cities–places of desire, longing, history, love, and dreams. This piece contemplates the Calvino work using the soprano’s extended altissimo range. Both instruments begin at the limits of their ranges (soprano low and piano high) and over the course of the piece, travel to opposite ends of their capable pitch. The original melody is taken from a traditional Syrian lullaby titled “Ainte”. 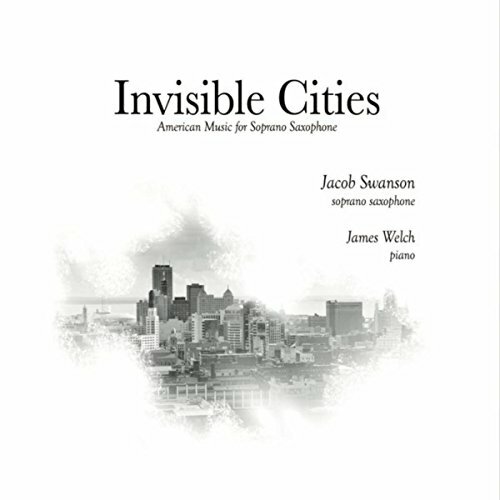 Praised by audiences and composers for his “gorgeous, lyrical tone, spectacular technique, and heartfelt musicality …” and presenting “the soprano saxophone at the height of its beauty,” Jacob Swanson has performed throughout North America and Europe on concert series, television, and radio.